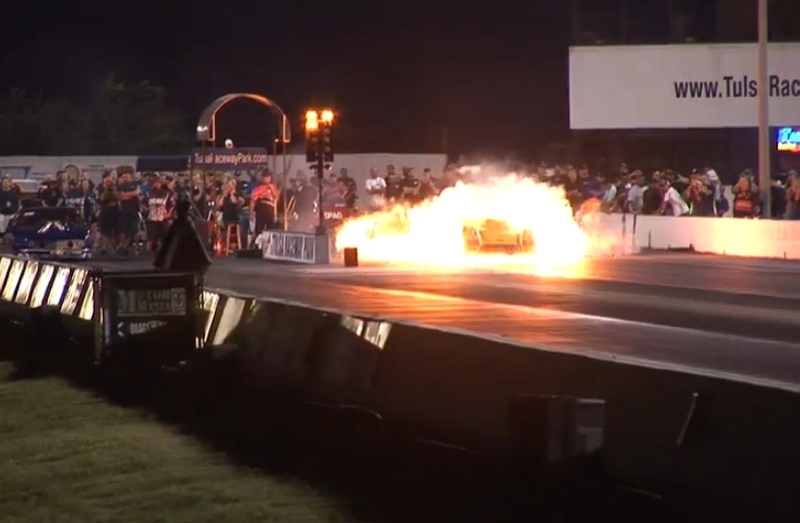 I have seen some stuff in my days as a drag racing announcer, especially out of the pro mod class but I have never seen anything like you are about to see in the video below. The driver of the car Jerry Yeoman comes out of this disaster OK but when I say that this event is virtually unparalleled in pro mod history, I am not sure that there’s going to be anyone arguing with me. Transmission explosions are one thing and they happen from time to time and there’s typically a pretty gnarly instant fireball and then it all just kind of dies off. Well, not this time. According to the description on Sean Melton’s Urban Hillbilly shot video, there was an electronic malfunction that allowed the RPM to skyrocket while the car was still on the brake and it blew the transmission cooler up, causing the huge fire that you will see in the video. What’s truly horrifying about this whole thing is that the fire is sustained inside the car and Yeoman is inside. He manages to bring the car to a stop but with the driver’s door up against the wall. Spectators and emergency personnel push the car back to give him an easier escape but we never see him get out. Can You Friction Weld With Your Home Drill Press? If The Answer Was Kind Of Would You Be Interested? Wood Wheels, All Wheel Drive, And The Hoonigans...What Can Go Wrong Here?